Karl Brazil has been the victim of this week's London riots, having had gear looted. Karl posted on his Facebook page: "have just found out that my drums have been stolen from a storage unit in Croydon. Pictures will be posted shortly. If you see or hear about any of these personal items please contact me on here. Rewards for for any finds!" 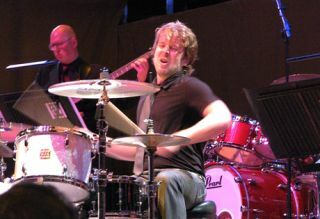 Amongst the gear taken were 12 snare drums, a Gretsch USA Maple in Matt Blue (sizes: 10", 12", 14", 15", 22") and a 1962 Rogers kit (sizes: 13", 16", 22"). Both are pictured below. If anyone has any information please contact us on rhythm@futurenet.com and we can pass on the information to Karl.